This is a great video on a few of the economic arguments in favor of radically extending human lifespan. As any semi-attentive reader of this blog will know, I’m a big supporter of radical life extension and huge fan of the work being done by Dr. Aubrey de Grey and the SENS Foundation. If you’re interested in learning more about negligible senesence and radical life extension, his TED talk from a few years ago is a great starting point. There’s been a couple of recent protests here in Seattle targeting corporate transit buses. First a couple of masked “anarchists” blocked a Microsoft shuttle bus. The next day, the same masked protesters blocked what they apparently thought was an Amazon shuttle, failing to realize that Amazon doesn’t provide shuttles and that they were actually blocking a municipal street car. In both instances the self-important oiks saw saw fit to distribute pamphlets they’d written for the occasion. Contra Microsoft. 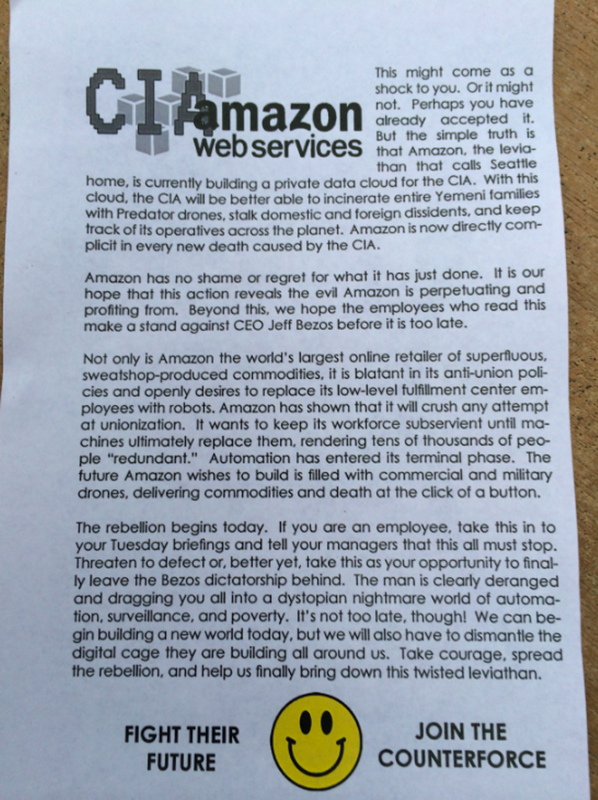 Contra Amazon. Rigorous, logical argumentation, to be sure, with beautiful prosody sure to stir the revolutionary soul. If this is what passes for anti-corporate agitation these days, I reckon the corporations have nothing to worry about. A word to the earnest young progressive agitators: This is Seattle. When you’ve lost the Stranger, you’ve lost the fight. I have a pair of Filson Uplanders that, while awesome, have always given me a little bit of heel rub, despite my best efforts at breaking them in. This morning I laced them up per this video and was able to walk a full four miles with no blisters or discomfort of any kind. So basically today was the day I finally learned to tie my boots properly.